Higher education scholars often conduct research on topics about which they care deeply, but to what extent should they be advocates for reform and social change? One school of thought believes researchers should remain dispassionate and data focused; the other, that a researcher, by the very questions she asks, can help effect social change. In this book, Laura W. Perna questions how, why, and when higher education researchers should be public intellectuals and whether, armed with research, they are—and should be—a powerful force for change. Taking It to the Streets collects essays from nationally and internationally recognized thought leaders with diverse opinions and perspectives on these issues. With the intentional inclusion of voices on different sides of this discussion, the volume offers a thought-provoking and nuanced understanding of the multifaceted connections between higher education research, advocacy, and policy. "Tackling an important topic from a variety of perspectives, Taking It to the Streets brings together a stellar lineup of experts in higher education." "Can higher education research be a driver of equity and social change? Yes, it must! This collection of essays from notable scholars aptly outlines various paths and approaches to the integration of scholarship and social justice. Research conducted solely as an academic exercise can no longer be justified." "Taking It to the Streets is a critical contribution to conversations about connections and contradictions between scholarship, advocacy, and policy. The expert cast of scholars consider perspectives rooted in history, policy, race, philosophy, and inclusive excellence to prompt readers to grapple with the enactment of social change in higher education." "How is academic research linked to activism for social equity? The education scholars in this book share why and how they do research for the public good—with rewards that are balanced by risks, disappointments, and worries. Collectively, they portray a field’s striving for and learning about relevance in research." "Historically, neither policymakers nor college and university leaders have found higher education research useful. This book is an invaluable resource on how higher education scholars can make their research important to policymakers and engage in advocacy, which is essential today. I wish it had been available when I began my career." "Taking It to the Streets presents reflective dialectics on the enduring and contentious relationship between knowledge production and the public good. For these scholars, the relationship between scholarly acuity and public advocacy on matters of educational inequity is a pragmatic as well as professional conviction. Such scholarly reflection is a rarity." 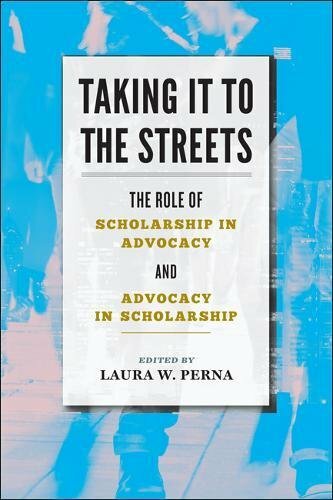 "In Taking It to the Streets, Laura Perna brings leading scholars of higher education into dialogue with one another and the reader. Taken individually, essays advance divergent arguments for connecting research and policy. As a conversation among colleagues, the book offers more than the sum of its considerably smart parts." "Perna has done a masterful job of shepherding a who’s who of scholars to explore the important linkages among research, advocacy, and policy. In an era of growing interest in higher education’s role in advancing American prosperity and equity, this volume is essential reading for scholars and those who are consumers of their work."